The publication of African Political Systems (Fortes and Evans-Pritchard, eds. 1940) marked the beginning of anthropology’s turn to comparative studies of political systems. The discipline’s comparative approach has grown to include the more diachronic and socio-cultural evolutionary questions raised by anthropological archaeologists about the formation of states, spurred by a revived interest in theory, new methods of data collection and analysis, and increased research funding. 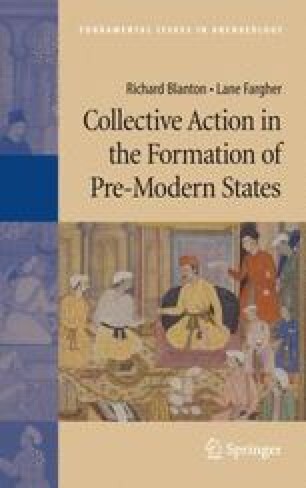 This book makes a contribution to this growing literature through its comparative study of pre-modern states, but we do something unusual in addressing anthropological issues from the perspective of a theory associated primarily with political science, the theory of collective action. The goal of this interdisciplinary strategy has been to enrich the quality of anthropological research, but we hope that political scientists and others will find our anthropological take on collective action intriguing, useful, and, perhaps, challenging.